Recently, I've been reading some sites that have criticized James Roday, the lead actor on the USA show PSYCH for an apparent weight gain. But you know what? Who gives a flying fizzle stick if James Roday is slightly larger than he was 4 years ago. Apparently, it wasn't enough to scare away his current girlfriend/ co-star Maggie Lawson. (Who is one hell of a Catch!) And NO they are not engaged. 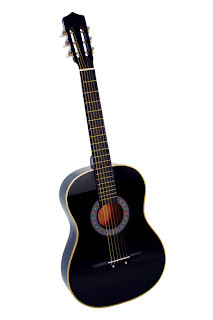 That seems to be nothing more than a rumor, but there is a very high chance of it happening in the near future. Anyway, as long as PSYCH continues to entertain I don't mind about James Roday's waist. He, and Dule Hill, and Corbin Bernson too, can eat all the fried broccoli they want. The last episode of PSYCH wasn't so smashing, but I don't blame it on dietary issues.
? he's not fat at all? but you know what? it's kind of nice to see a guy getting this kind of attention from the media. usually it's always girls. but it doesn't really make a difference. I just hate seeing how a lot of guys on TV can get away with looking like unhygienic schlebs (not that he is) and if a girl gains like five pounds omg she's OBESE. but other than that I have no opinion because I don't watch this show. 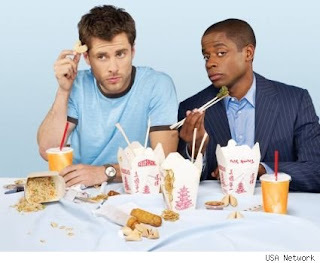 well that photo isn't the most recent one of him, but I just wanted a pic of James Roday and DH eating chinese food. but you're right....even presently, he isn't OBESE. I don't know why it's such a big deal for anyone, male or female. He gained a little weight. So what? imho he looks better - a little more everyday, average guy - with more weight. James Roday is far hotter than Maggie Lawson. Just sayin'! it ain't a big deal! the media's just stupid. if he gained 200 pounds and was driving himself around in a scooter then it would be a big deal. I just meant to say you rarely see this kind of spotlight shown upon a guy in the public eye. well, to some degree, but just think of like, Kelly Clarkson and Jessica Simpson. I just finished watching the season premier and he has gained a LOT of weight! I have always thought that he was really cute and still is a good looking guy but if I had a really popular show on TV I would do all I could to stay super fit and keep the show going. Hey James... P90X. I too haven't noticed much of a change in him till this season premier. he's bulkier, but to be compeltely honest i dont know if it's weight gain or muscule mass. the clothes from season 1&2 were polos shirts (mostly) and the occasional button up. he also wore a crap load of green (which i LOVED cause it's my fav color, and on him so bonus..err sorry..i'm rambling) but then they got him in other colors, plaids, and more plaids. i like the polos from the past seasons. whoever has been dressing him from season 3 on..needs to be smacked. the ill fitting baggy jeans and god awful plaid shirts completely squares his body off. you can't tell if he's just muscle or if it's chub. either way he looks fantastic, i like a man w/some meat on his bones, but like a said the costume designer for this show is making some VERY poor choices. and Gus is getting the same treatment as season 1 w/just a slight increase in the more dressy suit type clothing minus tie. he's far from fat though. Please someone help him find the number to Jenny Craig.
) I'll always be a huge fan of his and the series. Keep up the good work man!! @ Last Anon THANK YOU, that was meant to be the point of the post....but your words flow much better than mine. James has gained weight, to deny that would be to be blind. Sure, he still looks good and yes, age might play some part in it but not all. It doesn't matter to many and it doesn't matter to me but it does matter to the TV World. We all know that on the screen an actors/actress needs to look their best. That's the number one rule. Actors/Actress know that when they go into that type of work field. We all know that. Psych will not be playing forever, that is the sad, hard fact. I wish it would be different and we are blessed that is has lasted this long. Its a great cast and they work so well together. James is a terrific actor so we'll see him on the screen even after Psych is over. How much we see him depends on his physical appearance. The more fit he looks, the more we will get to watch his career move forward. if Nancy Grace lost weight and was somehow magically not ugly...I'd still hate her. he means what he says!